We had the interior of our home painted and some dry wall repaired. The crew did an excellent job. The house looks beautiful! The guys were great, very nice and very accommodating. 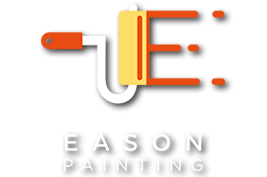 We have already recommended Eason painting to our family! Thanks again! As usual, we are very happy with the guys at Eason! We have now used Eason Painting twice for major work at our home. We are very pleased with their outstanding work. The Eason brothers are a pleasure with work and you would be hard pressed to find more courteous workers than their employees. We are completely satisfied and find their prices very fair. Jason was great.he was polite and a pleasure to talk to . He did a fantastic job. Clean up and was neat I wish I would have years ago. Very satisfied. Three rooms were painted and I am very happy with the work done. The two man crew sent out could not have been nicer and they cleaned up well and made sure that all furniture was returned to its original spot. They were on time and finished the job in the time that they said it would take. Fair price for the work also – I am a very happy customer ! The personnel and workmanship were excellent. The personnel and workmanship were excellent. The response to questions and concerns was immediate and handled with courtesy . The cleanup each day was beyond my expectation and the concern for and care of our possessions was professional. Thank you to all with whom we can into contact with, especially Jason and Scott, and of course, Kevin. This is not our first time using Eason. The level of professionalism was awesome. We have received so many compliments on the house. I am so happy with the way it turned out. Eason Painting did a great job at a fair price. Eason Painting did a great job at a fair price. They were not the cheapest bid we received but they were professional and I felt confident that they could handle our project in a timely manner…and they did! Thanks again. The emploees of Eason Painting were very courteous and seemed experienced in performing their work. The job was not the easiest: a 9 unit, three story brownstone condo with lots of rotted wood that needed replacing. Lots of ladders were required as well as a fork lift. Very satisfied with the painting. Very satisfied with the painting. Jason and Matteo did a great job,pleasure having them in my home. We would highly recommend this company to our friends and family. We had several quotes from many painters. We decided to go with Eason Painting because of their professionalism and their wonderful customer service. We received our quote the very next day, it was very reasonable for the job we needed done. The crew was very friendly and accommodating. They were on time all the days that they were here. And the entire job was done in a timely manner. We would highly recommend this company to our friends and family. Other than the dust (which is inevitable) I am very pleased with the fine job that was done. Also impressed with how fast the crew worked. Excellent work – good price. I highly recommend Eason Painting. Our experience with Eason Painting was a pleasure from start to finish. We received a very reasonable price for a rather large interior project. A three man crew completed the job including trim and wall repairs in just three and a half days. A task that would have taken me weeks and with a quality of workmanship that was superior to anything I could have achieved. Upon completion, company president Kevin Eason personally visited to inspect the job and check on our satisfaction. Eason Painting did an outstanding job! Eason Painting did an outstanding job! They did some drywall repair and painted our living room and foyer area. Kevin, Carl and Scott were awesome. If your looking for good service and outstanding quality Eason Painting is the place. Would definitely recommend them! Their work was very good and they were willing to work around my schedule and when a couple of unforeseen issues came up on the job they handled them for fair price.